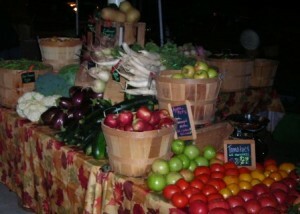 Saturday will be our final day for this year’s New Albany Farmer’s Market. Kenny has done a great job keeping the fresh veggies coming. It’s been a difficult task this year, last few weeks’ cold snap was painful to our gardens. We lost almost all our beans, most of the eggplants, peppers, cucumbers and squashes; but we hope to have some for this weekend. We will also have sweet potatoes, Kennebec, and red potatoes, onions, and fall/winter squashes (spaghetti, acorn, butternut, etc…). Tomatoes are still hanging in there, we should have plenty on Saturday… including heirlooms. There is some good news… plenty of veggies really like the cold weather. We will have plenty of greens: Swiss chard, kale, spinach and mustard; lots of turnips, kohlrabi, broccoli, cabbage, some cauliflower, and a great selection of radishes. Daikon and watermelon radishes will be in abundance again this week. We still have apples… Golden and Red Delicious apples will be available this week. If anyone wants to pre-order to have their fruit and veggies ready for pick up, just e-mail me and let me know early Friday. I will have your order ready when you arrive Saturday morning (that way you can sleep in, work out or just plain work and still get what you want before we run out). Don’t forget we have farm-fresh, free-range eggs available; pick some up at the market this Saturday. New Albany High School culinary students working with our watermelon radishes.